I can't believe Christmas is over. So sad. It's even sadder because all the snow melted right after Christmas! At first I thought it was great because it was 55 degrees (!!! ), but the very next day it went right back down to 15. Ugh. If it's going to be this cold, I demand snow! The holidays were pretty good, though. I got a bunch of awesome presents for Christmas, got to play a lot of Guitar Hero and put together the annual gingerbread house with my family and I didn't get sick at all! I always seem to be sick on Thanksgiving or Christmas, but not this year! I never did end up doing a different mani for Christmas- the snowflakes stayed on. I sorta ran out of time... Didn't need to stay up until 4 am to do my nails! 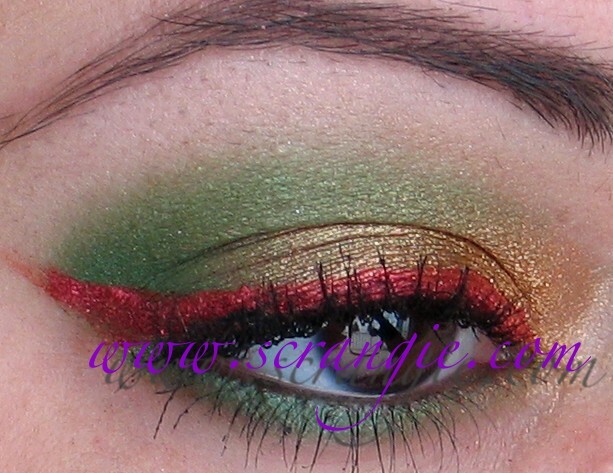 I put some red Aromaleigh glitter over the liner but it didn't show up at all, you couldn't see it at all in real life and I don't see it in the pictures, either. 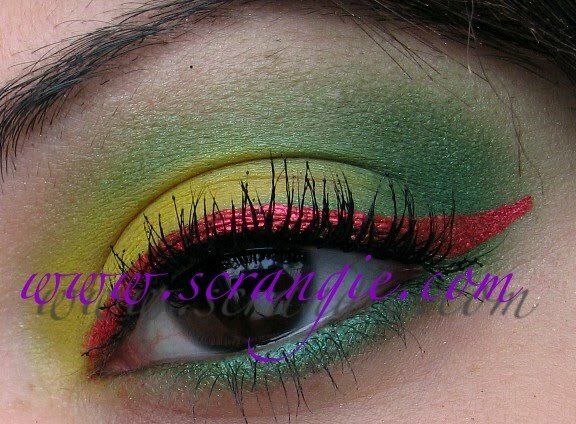 I see specks of mascara on my lid that I didn't notice until I looked at the pictures. Huh. And don't worry, I fixed my brows. I love a matte lid. It always looks so smooth and soft focus. 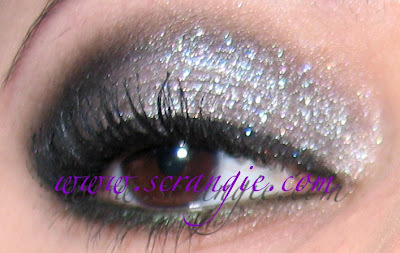 Matte lid with glittery stuff everywhere else! Except not much glitter on these days. I did plain red lips. I don't think I can really pull off red lips. Dinosaur Plushie is really pretty, I didn't really capture it well in the pictures. It's a silver with hologram-type shimmer. It goes on a little... rough? Flaky? But it's so nice and sparkly. And then, on New Year's Eve, I just wanted to go all out. I haven't had any luck using Pixie Epoxy as a base for shadows, but it is EXCELLENT for getting glitter to stick. I had almost zero fallout- all the fallout was from the brush, not my lid! And it stayed on without fallout all night. I put the Pixie Epoxy on pretty thick over the silver HIP shadow and immediately patted on a bunch of MAC 3D silver before the epoxy had a chance to dry. Perfection. And to make it even more ridiculous? I wore OCC Anime lip tar. Anime is the most ridiculous neon pink ever and I adore it. I've been meaning to do a Lip Tar review for ages... I need to get on that. I didn't make any New Year's Resolutions yet. I'm thinking I'm going to try to spend less time online... Maybe I'll resolve to review more random items from my collection... Or maybe not to wait a year in between haircuts? Hmm... I'm drawing a blank. Did you make any resolutions? Those look great! I have makeup but I have never gotten around to using them (eyeshadows especially) cause I never learned how to apply and which colors goes with which. I'll try some of your looks. It's such a waste if I don't even try! 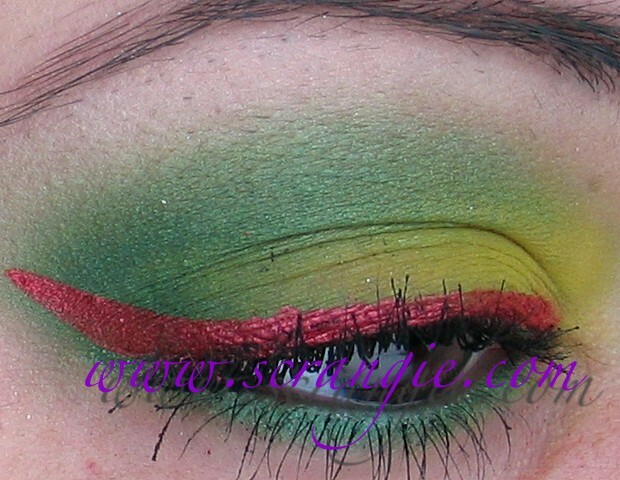 How do you put the epoxy over eyeshadow without smudging it? beautiful as always, you make it look sooo easy!! Love em all but NYE is baller. omg the new years eve seriously beautiful!!! All three looks are great, but I am just mesmerized by the holo glitter in the last one. With the Anime Lip Tar, the look must have been amazing! 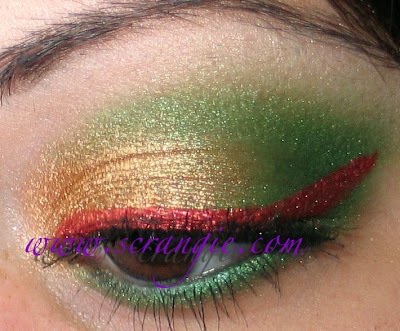 Your New Year's Eve eye look was amazing, I covet it :) Great job, I love looking at your makeup pics, I wish I had the time! OMG...my favorite ever. 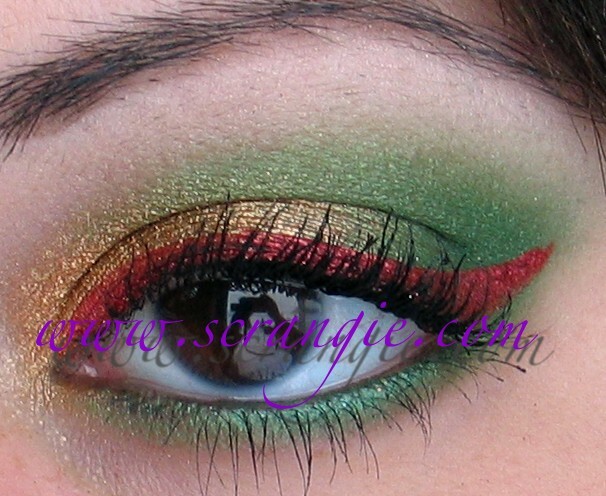 The New Year's Eyes are to die for! Love it. I love all the looks! What fun! Love all of your creative holiday looks for eye make up. Very bling-y and pretty. Happy New Year. 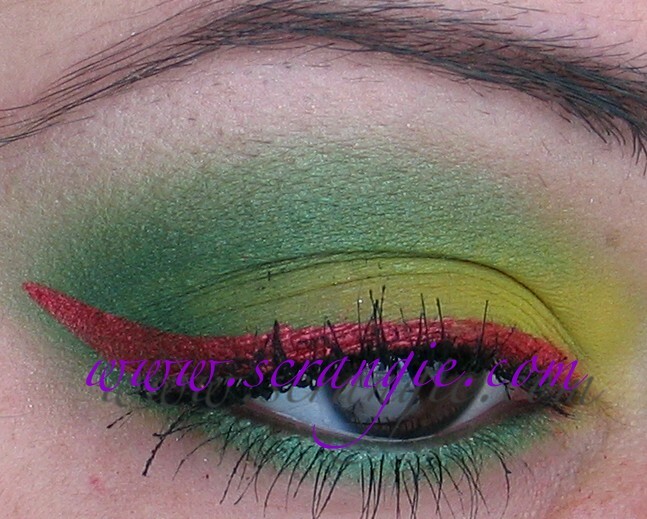 Very nice holiday looks! You are not the only one who gets yearly haircuts. I am going in for my "annual tuneup" as my stylist Don calls it. I worked with him for many years, he has worked on my hair since 1983. I always let it grow out and just tell him to do whatever he wants. I have never been disappointed. I have been doing the "beachy waves" look, but my ends are so fried from heat styling, even Joico Color rescue Protective oil isn't helping any more. Good luck on your next haircut, I am makng my appointment today. Love love love the NYE look! They're all fab but that one is just amazing! Whoa! 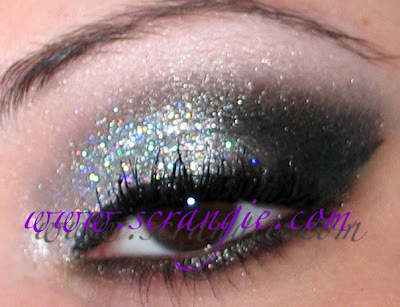 The holo glitter in the last few pictures really commands attention - love the look you've created! 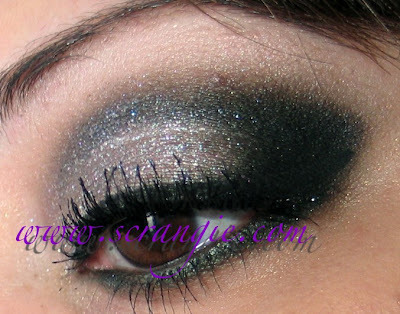 your NYE eyes are STUNNING! I *love* the last one. Must recreate it. Loove your blog Scrangie! Happy New Year!! Your eyes look amazing in all of the pictures! Wish I could be as daring as you! Your Christmas eye makeup looks are just beyond words. Love all of your makeup looks! Beautiful. Mimi, it patted it on with my finger, but it did smear a little!